COMPACT SHAPE：13.2x9.5x7.5 cm small size, it's very easy to carry and use, whether in your house, in motor homes, in garage,or in a hotel. It does not take up much space in your suitcase. The mosquito killer lamp use the strong phototaxis and thermotaxis of mosquitoes to attract mosquitoes into the lamp, and killing by the high voltage.Due to its size the effective coverage is about 10 square meters. ENVIRONMENT-FRIENDLY: No Chemicals, no fumes, no smell, no sprays and no mess.No more pesticides or potentially harmful sprays. Get rid of mosquitoes fast without sticky, messy poisons or sprays. Great for places where pesticides can't be sprayed like kitchens and hospitals.It's also Average Power Consumption only 1W,just cost 20 US cents every month even though it operates continuously. 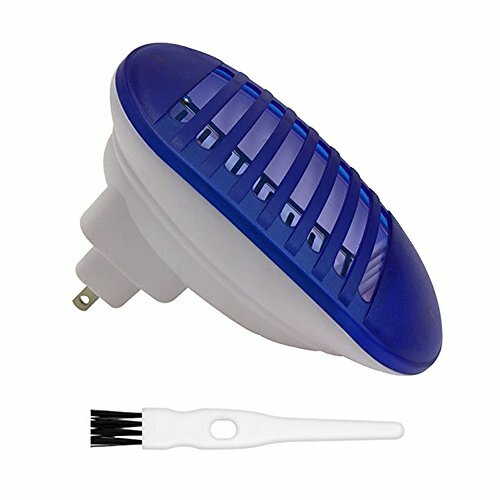 EASY TO USE AND CLEAN:Just plugging into socket, this insect zapper will working!To clean dead mosquitoes, ensure the unit is unplugged from an electrical outlet and then use a screwdriver to touch the metal plate for static electricity release. Remove the lid and clean mosquitoes or gnats with tissue or a small brush.WE GIVE YOU A SMALL BRUSH. NIGHTTIME:Its LED lights can effectively attract mosquitoes and small flying gnats. Mosquitoes eradication become very effective and can prevent you from mosquito bites. It just makes small noise which would not disturb your sweet dream. FYA &GUARANTEE:This electronic mosquito catcher can be only used indoor, also can't be used in wet room, such as bathroom, laundry and sauna etc. Due to electric shock danger, please do not touch the high voltage grids and keep it away from the children is necessary. If you are unhappy about the quality of our product, we will exchange it with a free one. If you are not satisfied with our products, we will guarantee to provide you with a full refund. If you have any questions about this product by SENDOU, contact us by completing and submitting the form below. If you are looking for a specif part number, please include it with your message.